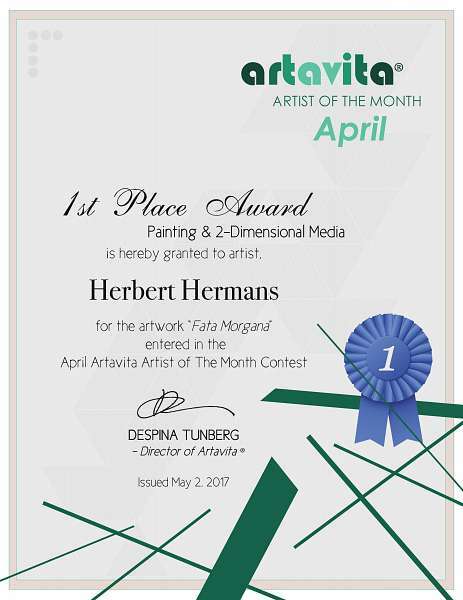 Met het schilderij 'Fata Morgana' is Bert Hermans door de jury van Artavita gekozen in de categorie 'Painting & 2-Dimensional Media' tot 'Artist of the Month April 2017' (zie https://artavita.com/contests/29). Artavita is een wereldwijd online forum voor kunstenaars, waaraan enkele duizenden kunstenaars uit de VS en vele honderden uit de rest van de wereld deelnemen. 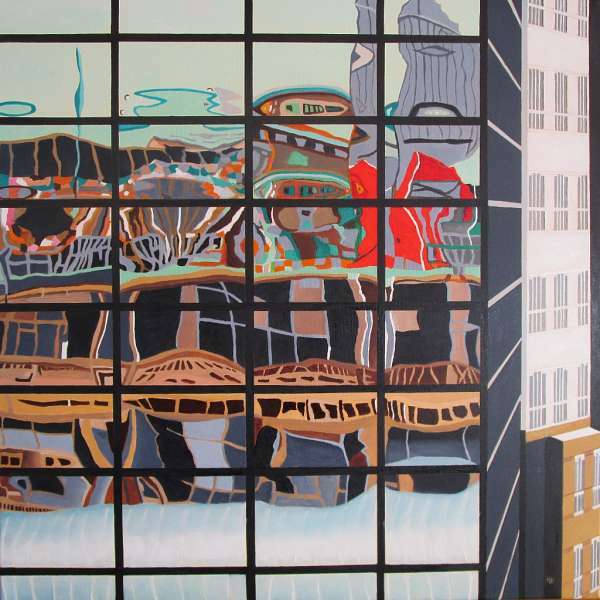 Dit schilderij is te vinden onder de rubriek 'Groothandelsgebouw Rotterdam'. In oktober 2018 heeft hij tijdens de Annual Dutch Art Fair van de vakjury een tweede prijs gewonnen. Hij werd gekozen uit 190 deelnemers uit 13 landen. Bert Hermans is since the end of the eighties a passionate painter and he owns now an atelier at the Vest in the historic city center of Gouda. 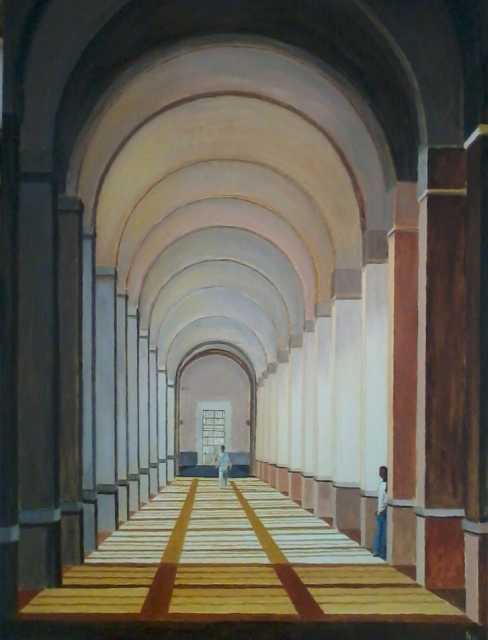 There his work consists mainly of oil paintings. His mayor theme is industrial and cultural heritage. At the beginning of his painting career he followed different courses in acryl, waterpaint and oil painting at the art school 'Stichting Kunstzinnige Vorming Rotterdam'. He further developed his technique by following courses in the atelier of Clara Miedema in Rotterdam. Bert is nominated in 2014 for title 'Painting of the year 2014' en in 2016 for the title 'Painting of the year 2016' with regard to his paintings 'Het slachthuis' and 'Don't shoot the piano player'. Bert was in december 2016 among the 50 artists who were shortlisted as finalists in Artavita’s 21st Online Art Contest and won the title 'Artist of the Month' in April 2017. 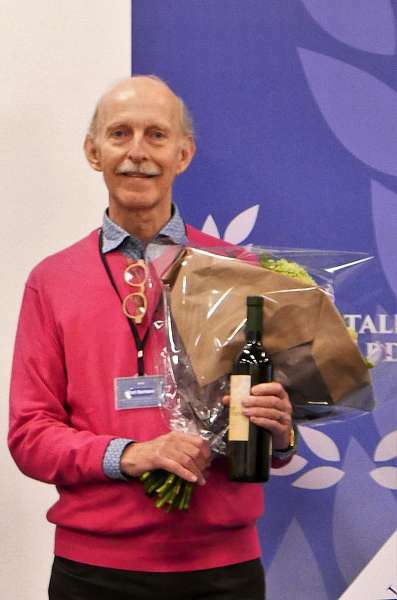 Bert won the second price during the Annual Dutch Art Fair in October 2018. He was choosen out of 190 artists from 13 countries. © Bert Hermans. Bert Hermans is the owner of all the intellectual property rights - among others the copyrights - to all of his works in all media, whether in public or private collection. His works are protected by international copyright law. All rights reserved. No work and/or any part of this website may be reproduced, stored in a retrieval system, or transmitted in any form or by any means, electronic, mechanical, photocopying, recording or otherwise, without the prior written permission of Bert Hermans.